Chicken wings aren't just bar food – you can easily make these Sweet and Sour Chicken Wings in your own kitchen, and in the slow cooker, no less. The resulting wings are tasty and fall-off-the-bone tender. Though chicken wings are perhaps the quintessential bar food (heck, there are several restaurants in which "wings" features prominently in their name! ), I have never actually eaten them in a bar. Though my college town did have a BW3s (aka, B-dubs), I think the only time I ever went there was with a group of friends during my senior year, and by that time I was two years into what would become a decade-long stint as a vegetarian. Ergo, no hot and spicy wings for me. And even after I broke my vegetarian diet back around 2005, I rarely order meat at a restaurant, and bar wings are not particularly a draw for me. But I have made wings at home. Several years' back when we lived in Philly, I baked up some Buffalo wings for Dustin to enjoy during the Super Bowl. However, I spied a package of organic chicken wings at the grocery store yesterday, and seeing as it was the only thawed chicken available, I decided to go for it. Rather than just wing it (ha ha! 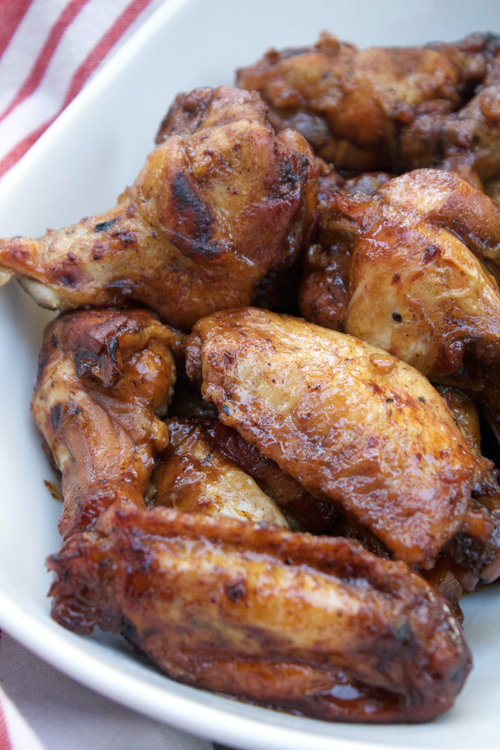 ), I searched the Internet for a few options and came across a couple of recipes for slow cooker chicken wings. I switched a few things around, including significantly decreasing the sugar content, and the resulting recipe is quite delicious. 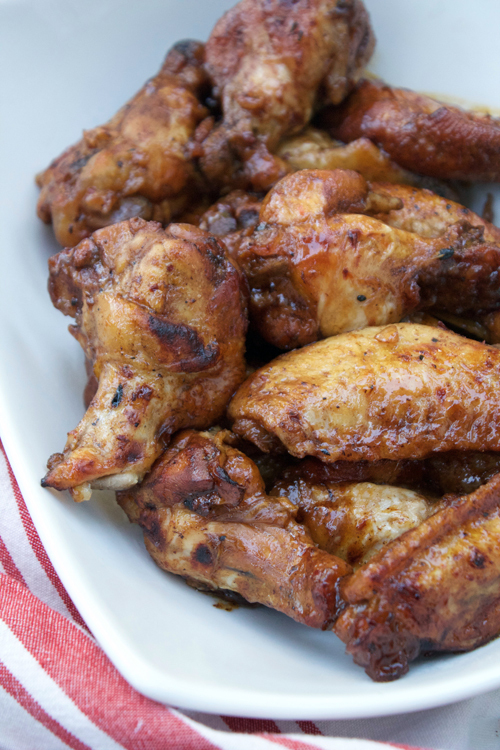 After two hours in the slow cooker, these chicken wings are incredibly tender. A couple of minutes under the broiler crisps up the skin and caramelizes the sauce. Serve alongside extra sauce (and plenty of napkins), and you've got a winner of a meal. 1. Lightly coat the bottom of a slow cooker with cooking spray. Add the chicken wings in a single layer. 2. In a bowl, whisk together all of the sauce ingredients. 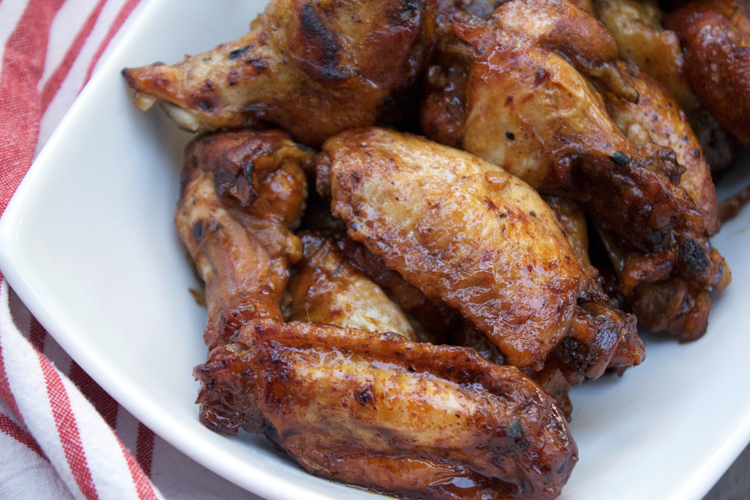 Pour the sauce over the chicken wings and spoon over the chicken to evenly coat both sides. 3. Place the lid on the slow cooker and cook on high for 2 hours or low for 4 hours. 4. After the cooking time is complete, mix together 2 tablespoons of cornstarch in 1/4 cup water. Pour the cornstarch mixture into the slow cooker and stir to combine. Cook on high for 10 minutes, or until the sauce has thickened. 5. Set the oven to broil. Carefully transfer the chicken wings to a baking sheet lined with aluminum foil. Broil for 2-3 minutes, or until the chicken begins to caramelize and lightly char. 6. Serve immediately with extra sauce on the side. And don't forget extra napkins!